Bruce Norris is joined this week by his son Aaron Norris. His role with The Norris Group includes loan officer, office manager, and business development. 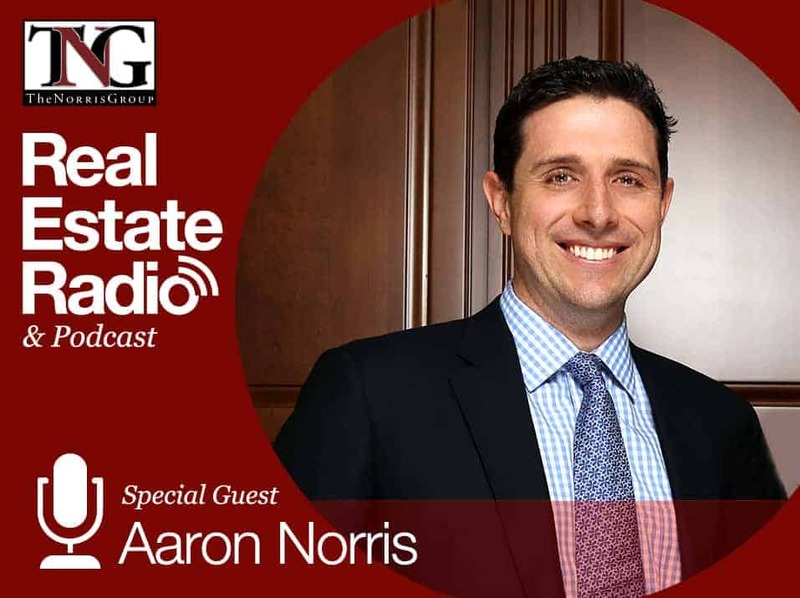 Aaron has been in the real estate field for over a decade, having worked in the construction and design industry before joining The Norris Group in 2005. He speaks nationally on topics including technology and real estate, artificial intelligence, robotics, shared economy, virtual reality, and intech as well as marketing and PR trends. He has contributed to Forbes, BiggerPockets.com, and ThinkRealty magazine. He has an MBA from UC Irvine and is a credited public relations professional and APR. He also holds his certified specialist in planned giving CPSG designation. Why did Aaron choose to pursue several different designations? Does a business’s reputation still hold a lot of weight when it comes to hearing from potential clients? What were some of the tech shows Aaron attended to learn more about real estate technology? What were his biggest takeaways from these shows in regards to how they were changing the industry? What are people doing to make building and other aspects of life more robot-friendly? How could all these changes and advancements in technology change the way we do things? What are some ways the Norris Group is now investing in Florida real estate? Just reading this allows Bruce to realize how much things have changed. Bruce did not need any of this, and now you cannot even market without understanding it. Aaron said sometimes it is just clues. In the Better Business Bureau, they have a very specific demographic and A+ rating on the BBB. It’s magic. Millennials may not understand this. Aaron did all these designations because he wanted to learn. Aaron is just waiting for someone to give Bruce an honorary doctorate with as much as he reads. Just because you have degrees, it does not mean anything. But, Aaron learns best in a structured environment. Aaron learned a lot through this process; but unlike Bruce, reading on his own has never been easy for him. Bruce said it was so different for the first 15-20 years of his buying experience. He ran an ad in the newspaper; and people read newspapers at this time, so he could buy properties and make a living. A decade later, things have changed, including how they contact their clients. Things thy used to read 5 five years ago, like an email, are not there anymore. It has definitely gotten more complicated, and there is so much noise out there. When Aaron speaks on marketing and PR, he often has a conversation of how much time the consumer needed before they would do business with you when taking a marketing class. It was 7 impressions of your organization. Aaron was at a public relations event two years ago, and the lady speaking was part of a data analytics company. She said the number was closer to 21 now. The problem is you have so many distractions now. Aaron is that guy watching Game of Thrones on the tv while playing a game on his iPad while texting. You never have his undivided attention ever, and this does not even include all the notifications that pop up on two of those devices while he is triple-screening. It has gotten more difficult. Aaron still loves direct mail and phone conversations. However, to him technology is causing a lot of noise. Bruce asked if reputation of a business still holds a lot of weight and an effective method for hearing from people. Aaron said yes and that they were one of Microsoft’s very first partners signed on to a customer relations management software they had in the cloud. They were one of the first ten. One year, they gave up 26 weekends. At the end of the year, they ran the data on where their leads were coming from as well as people who ended up in their database. Speaking was number 3, and a little bit further down on the list than he was expecting. The biggest factors were split between search engine optimization, the internet, and referrals. As a marketer, Aaron can see what he would need to do more and still speak. The next year, they stopped speaking on weekends to no detriment to their lead sources. Sometimes it is just trying to find out what is actually working. It is easy to get distracted by the number of people coming in and converting. Aaron has always had a unique opinion on emails and how to contact people. He is always about white hat strategy, and some marketers completely disagree with him. White hat strategy means you are always doing what is not always expedient and easiest. He could buy 100,000 friends on Twitter, but it does not mean they are actually his friends or care about what he actually does. He has caught some of the hard money loan competitors doing this, and it is clear they have purchased ratings from Pakistan. You can tell by the broken English and source where they originated. At any time, Facebook can say you do not do money in Pakistan and they are all junk. They have decimated their reputation online and do not even know it. When it happens, they will have to start completely over again to their detriment. If you do not know this is coming, it is a detriment. Some people who do not put on their real marketing long-term strategy hat will be sold to a marketing company trying to show numbers, Facebook friends, and likes. This is not the most important piece. The thing Bruce is most excited for with Aaron and the company is he is creating his own identity of expertise. Bruce has had the timing space, and he thinks Aaron will have the future space. Aaron goes to these tech shows; and one of the perks of being connected to the media is he has a press card and can be invited to things like this. It feels weird for him being at the table since they have been focused more on information and do not sell on the show. They have become like media Switzerland, and it is not unusual for him to get a phone call with a reporter wanting to talk shop. There is not expectation they will be covered in the source, but they are seen as a safe place to get good information. They have positioned themselves as a leader in the space, and this takes time. The tech show in Vegas was an invitation-only event. Aaron belongs to the National Association of Real Estate Editors because of I Survived Real Estate and the radio show they have done over the years. The only two investor source at the conferences he goes to are typically him or BiggerPockets. The rest is the regular media. He could go to the Consumer Electronics Show and the Builders Show because he was part of the organization, but getting in took over 10 years. Not only was he building the program, but he was also showing that they were adding value. Bruce asked Aaron what he took away from the shows and how he saw them changing the industry. Aaron said the Consumer Electronics Show was interesting in that it was a little bit different than he thought it would be. He was expecting to see a lot more forward-looking things and was there specifically to understand artificial intelligence and the connection with Amazon, Alexa, Google Home, and all these big companies fighting to be your ecosystem of choice. He was interested in learning about Blockchain and robotics and how we will live in the future. Someone from Toyota even mentioned how in ten years the average household may not even need cars. At the conference, they talked about how in the future we will be willing to spend the extra money on a robot assistant for the home. Aaron got to meet a handful of these, including Pepper and Timmy. They will be working with seniors, telling them jokes, reminding them to take their medication. They are positioning to be caretakers, and Aaron ended up taking a health track. One of the panelists said 80% of healthcare will take place in the home because of wearables and robotics. It’s all coming together and forcing Aaron to put his real estate investor hat on to see how it changes design. Aaron told one panel how he was in real estate and investing in building. He asked what he could change in the design process to be more robot-friendly. He even wrote a Forbes article on a robot-accessible home coming soon. This could include no shag carpet, no stairs, no high thresholds. Ultimately, it becomes a tie breaker. This is why their builder in Florida goes to these. He and Aaron hung out at the International Builders Show, and he realized how little he knew about building. This was the first time in this environment and looking at everything for sale and all the trends happening. He enjoyed the press conferences more since this was where they were releasing all the data. They had the builder show on a couple weeks ago where they talked about the consumers, different demographics, and what they want. He has definitely inherited the piece from his dad where he likes to look at all the data from the recent reports the California Association of Realtors released. This included information about what realtors want as far as the buying process from the home, neighborhoods, and state to where they are moving. What is interesting is real estate investors have to know all of this since it ties into what they are doing. Bruce did a timing report a little over two years ago with a chapter Aaron wrote on this. Although Bruce was not able to absorb 50% of it, it was great for the exposure. This is the niche Aaron will own and is a necessity since things change so fast. Aaron was on the road for the past couple years, and what is fun and stressful about it is every time he does it, things change because new things are coming at them all the time in the different buckets of what he covers. This could catch people off guard, and Bruce thinks there is speed to this. There is a lot of big money chasing first-time events. You will have some results when you throw that much money at things. The biggest thing Aaron is looking at right now is the 5G connection. He was not entirely clear on this, but neither was anyone else. People are using it as a marketing tool when it is not really a reality. Aaron talked to some people at Los Angeles Water and Power, and the technology requires a lot more antennas to work a lot closer together. The only person with that much real estate is a utility company with poles who can put them on the land. They have not started this in mass yet; and if you are not doing it in the city of Los Angeles, you are doing it wrong because of the demographics being largely millennial, and there are a lot of them who live in the Los Angeles County area. One company is talking about rolling this out in some markets by April, so it is a race. All of a sudden, driverless cars are no longer an issue. You can do things like artificial or virtual reality that is completely wearable since you are not tethered to a computer. Batteries are getting smaller too. When you no longer need to have the data on the device and it is connected to the cloud, it is an immediate communication. All of a sudden, think about how small things can get. One of the very first devices he saw at CES was a hearing aid that could transcribe language in real time and detect the fall of a senior. It could even monitor your heart rate. There is convergence because you no longer need a hard drive hanging out of your ear to work. When all these things get smaller, you no longer have to have all computing power on board. Aaron does not even think we will need to be looking at computer screens, or at least cell phone screens in short order, especially with 5G. Apple just came out with their watch where the EKG data is coming through on your wrist. It is not just a watch, but also a healthcare monitor and can text. It will happen fast; and although it doesn’t seem like it could carry over to real estate, it could certainly change where we move, why we move, and trends in what people buy and why. This is very important in the building business and a big deal if you get one step ahead of this. They next went on to talk about investing in Florida, which Aaron has had experience with himself. Bruce asked Aaron what his first exposure was to owning something in Florida. Aaron said Greg was out there flipping properties and gave him a condo in the Orlando market that he did not want. Aaron had some cash laying around and bought it. It is the most unique condo he has ever been a part of, 1800 square feet, two-story, and a mini pool in the backyard. Dalton will be building higher end condos in Florida. It has done well, and Aaron has had a great renter in there. He put $20 grand into it, and he would live in it himself. All the Florida rentals they have are ones in which Aaron would live. All the ones in Leesburg are really nice and in a nice area. Aaron always talks about how he got into the business when he speaks since this is the most fascinating piece of what they do. Everybody comes at this from a different angle. Aaron used to be an actor in New York, and now he is making up for financial lost times. This is his first real estate cycle, so he has a lot of condos he bought at the bottom of the market. He has rentals from the 70s and 80s as well. He does not want to deal with repairs anymore, so it is good that they have done their job. Moving from one single-family property in Riverside to three brand new homes in Florida and going from $1,325 rent to 3 houses with $1,325 in rent was a very powerful moment. Through this, Aaron learned he is definitely a buy and hold investor. This was his goal, so he is looking forward to doing as many as possible. The idea of the Florida bootcamp came from their own experiences. The exchange he and Bruce did and the happiness they have had over owning the inventory they have now as opposed to what they owned before has really inspired them more to want to share. They wrote a document back in 2006 that they were going to get out of California, and now they wrote a document about California on borrowed time. The idea was if you are going to exchange someplace, Bruce wanted to make sure it made sense why he did it. They just recently had a bootcamp. He knew the investors had a lot of experience and are used to making their own hands on decisions. The biggest thing they needed to accomplish in the bootcamp of 70 people, which was deliberately small and allowed personal attention, was when he interviewed each of the people. When everyone got up there and were responding to questions, Bruce could see there was a level of acceptance that had happened. He and everyone in the audience could tell these guys were the pros, and he did not need to fly back to Florida to check out his stuff. That responsibility is intense and has been a journey. The book they created was 190 pages, and they intend to leverage the portal more for this. They are creating videos on everything from endangered species to utility systems for properties. When Aaron went out there for the first time, he really wondered how you get to know the area and pick a lot. Bruce could stand on a lot for a week and still not make the decision somebody who had been there for 30 years would make. The danger of showing up with your California hat could lead you to make five mistakes or more, especially with your 1031 exchange blowing up your timeline. You would be paying a lot in taxes. There is one particular endangered species where if it happens to be in breeding season and you get caught, you could be on hold for five months before solving the issue. Going into a new market and not knowing what you are looking for is dangerous and embarrassing. They did not take their book lightly nor the trip. Bruce spent an hour with everyone there, and they all went after the timing report. The meetings were individual, either on the phone or in person. This was exactly what he needed to do. He needed to qualify them to make sure it was a good fit for them and whether or not they should keep their inventory in California. He also told them what to get rid of and why they bought it so cheap in the first place. In a next downturn, even if it is mild, that inventory could get killed. Why not trade something 40 years old in a so-so area for a new house. Since Bruce did that with his inventory, it was easy to want to pass that on since his life was boring since the rentals showed up. Aaron still has some things in the area, although he is not sure if he is going to sell everything. The journey into the inventory and a nice ten-year run of not having to fix things and the level of tenant it attracts has been fun. The Norris Group is also going to create a fund. Greg flipped about 80 houses in 2016 and 2017, and one of the difficulties was they came at the end of the foreclosure cycle. There were properties that had been vacant for four years, or the people had been occupying them for four years and not caring. Greg is so good at estimating repairs in California since he has done it almost 1,000 times. Florida had this twist of a Florida house sitting there for a while that needed more repairs. Greg has talked about roofs and air conditioners that can catch you off guard, and in the Florida market the home inspectors can really nail you and blow up your transaction if they are not up to snuff. Bruce is excited because of the contact he has made with Dalton and his team, who takes care of these things. Bruce likes the product they built, and the model was received so well. Everybody who walked through said they did not have any rentals like that. Dalton and the Norris Group are going to put together a partnership where it is almost like they are investing in a trust deed and get a return. However, they product they are selling is new; they are not flipping old homes. With everything covered over the last couple years, especially with John Burns and his book Big Shifts Ahead, their mission is to build wealth and legacy through real estate. They have really helped accomplish this. Bruce has done this twice through two full cycles. His first report was The California Comeback in 1997, and his second was The California Crash. Bruce has helped people make and save the millions, and now this new cycle of people can look at their portfolios strategically. They may not decide to buy anything, but them being grateful to go through the process is how Aaron and Bruce looked at the market and the date. It was fun and rewarding, and Bruce and Aaron could possibly be looking at doing a Florida timing report and tech day for next year.